My kids, ages 8 and 11 approached snowboarding for the very first time with confidence. I listened to comparisons of their skateboarding and surfing experiences – and honestly thought that snowboarding would be humbling. With solid expert instruction, the kiddos proved me wrong. Mount Snow’s Ski & Snowboarding school offers a variety of lesson options beginning at just three-years-old. 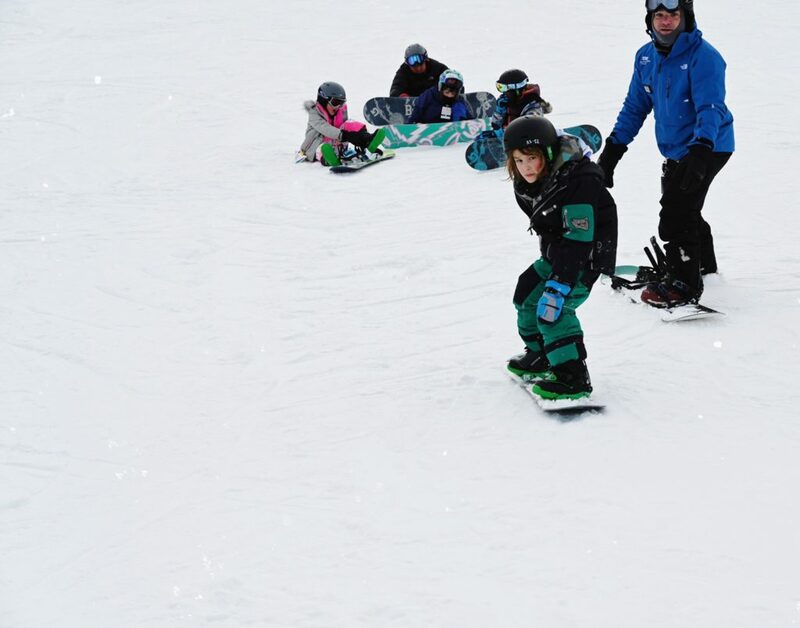 We opted for the Mountain Riders full-day (snowboarding) camp for kids ages seven through fourteen, placed in small groups by age and level. I couldn’t believe that my children were up and going, and riding the chairlift at the end of their very first day. Rick, their instructor, knew just how to work with my daughter and son – and even pointed out to me how skateboarding helped them naturally nail their turns. After a full day of Mountain Riders camp, I rode the chairlift with the kiddos until closing, absorbing their excitement and cherishing the moment (and awesomeness!) of being together on the mountain. We arrived at the Discovery Center, early the next morning to enroll in another full day of camp – and stayed again until we found ourselves on Sunday’s last chairlift of the day. I think it’s so important for these sort of challenging “firsts” to be positive experiences – and our pro instructor dialed my kiddos right in. The kids progressed a “color” level each day of camp, while I was free to enjoy the slopes on my own before regrouping for many runs together in the late afternoon. The rental process was also a well-organized breeze. 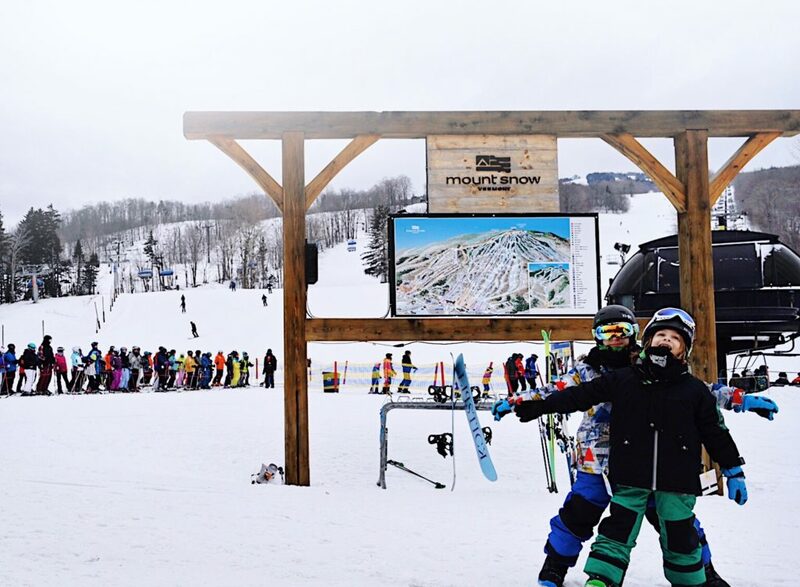 Fully immersing my beginners in Mount Snow’s snowboarding camp was hands-down the best decision – and a win-win for the whole family. 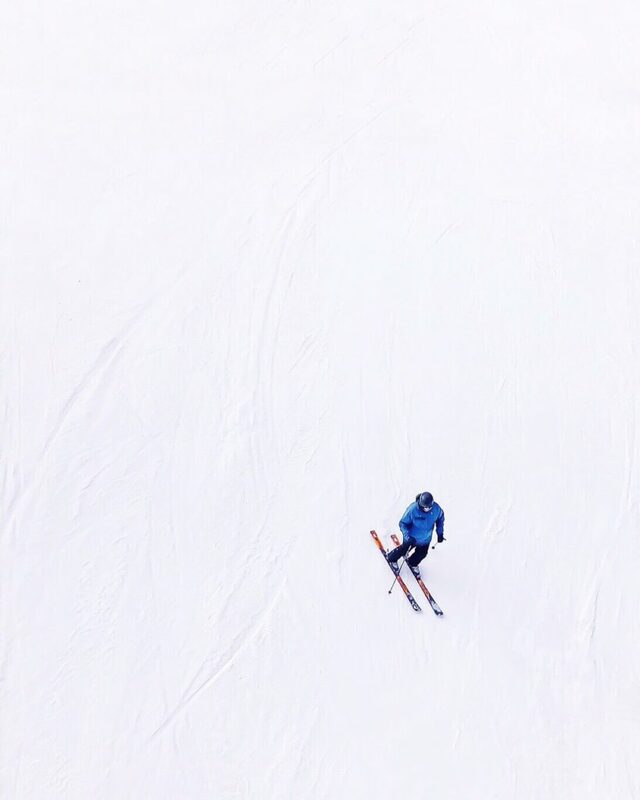 I had high hopes of my husband catching the ski bug – and I certainly give him an “A” for effort. Let’s say that there were a lot of laughs the moment his boots clicked into bindings – but all worked out because Mount Snow manages to make those who prefer all-day-après still feel connected. Work-out at the Grand Summit Resort Hotel’s fitness club, and unwind in the sauna and steam room. Then grab a beer at The Bullwheel (or really good coffee in the Deli if you need it!) before meeting the kids for a coveted waffle after their lessons. Gone are the days of having to haul it back up the hill after the thrill of tubing down the mountain. 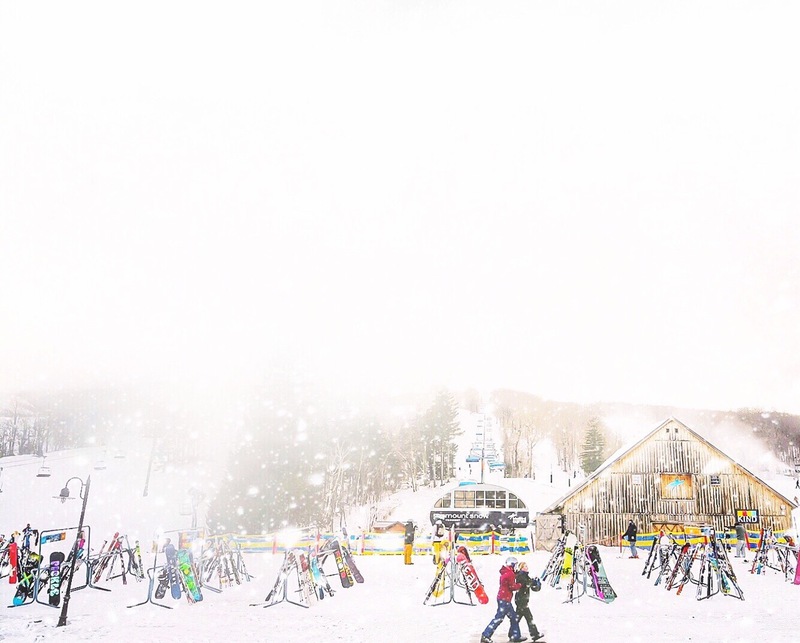 Mount Snow’s “magic carpet” makes the way back-up super fun. 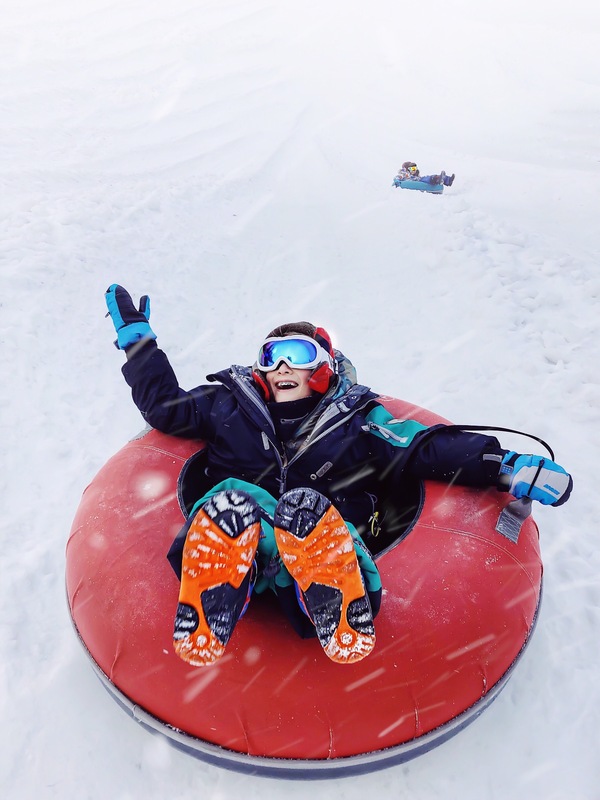 With eight tubing lanes, the whole family will want in on the action – and the best part is that you don’t need any special skills to be the queen and king of the tubing hill. A family ski trip undeniably involves a lot of gear and the good-sort of exertion. 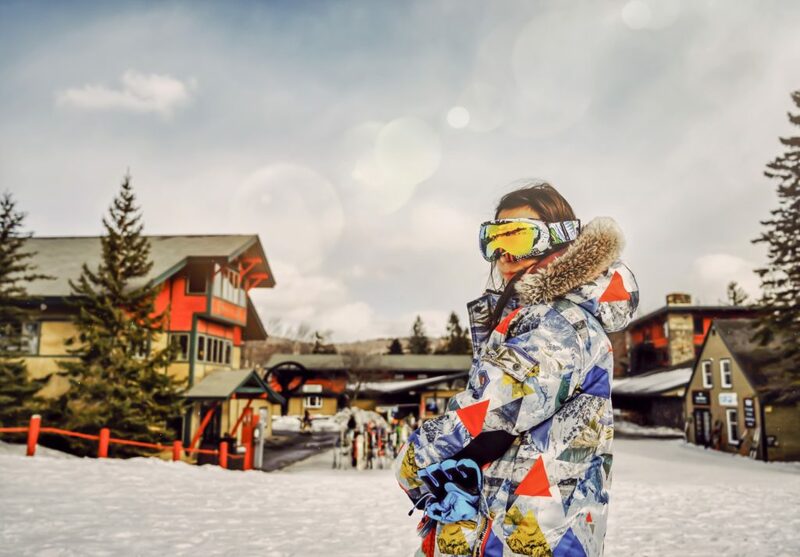 Mount Snow’s Grand Summit Resort Hotel located at the base of the hill handles the transition from slopes to chill-mode as a family seamlessly. The hotel offers several room size options, dining options and an efficient system of checking your skis and snowboards at the hotel entrance – all within a short walking distance to the slopes. On my solo morning, I was able to click my skis on – and take off directly from the back entrance. We didn’t have to move our car the entire four days of our trip – and staying on site made family travel with kids a breeze. The indoor/outdoor pool and hot tub invoked a lot of “oohs and ahhs” while night-swimming (outside!) during a serious snowfall. Seafood all-around at Harriman’s Farm to Table was our most memorable meal – and the kids were thrilled to get in a bit of post-dinner arcade action. And although I intended to have time to indulge in the full-service Nature Spa, or take a yoga class – the mountains were calling! I don’t know why I assumed I’d be back to beginner-status after a nearly 20-year break – but it’s thrilling to come to realize that skiing isn’t something you just forget. After overcoming a bit of fear, I enjoyed run after run without wanting to stop and take a break. My re-entry experience was nothing but positive because Mount Snow’s trails are so well maintained – boasting the most powerful snowmaking system in the Northeast. 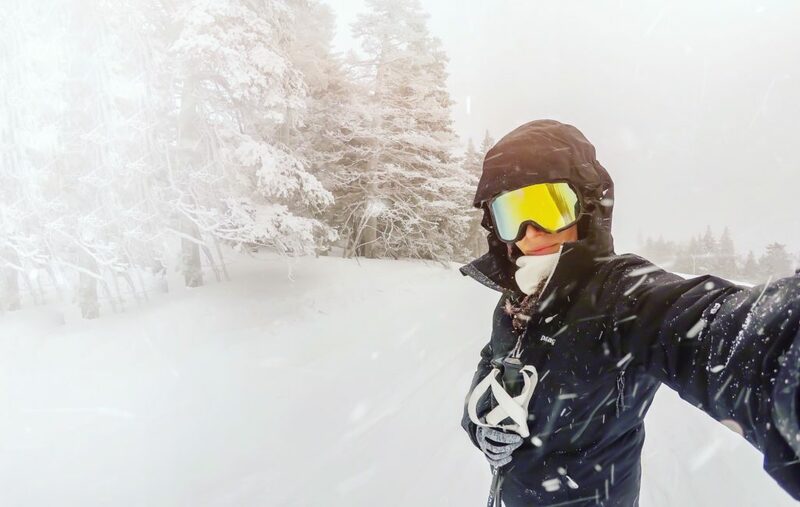 I didn’t come into contact with the sort of icy trails that scared the living daylights out of me in the past – thanks to the snow guns blasting. I spent most of my time catching the Bluebird Express (inside a super cool blue plexiglass bubble shield ) up to the top of the mountain while adventuring through fun green and blue trails on the way down. Every run felt like a different thrill, with new turns to discover on the way down. The stunning views (sometimes amidst a total whiteout) absolutely took my breath away. We drove away from the beautiful green mountains feeling exhilarated, excited and reconnected as a family. My kids are so pumped about snowboarding, and I’m thinking about all of the other metaphorical mountains in my life that I hope to revisit and conquer. Beginners – take advantage of the Peak Discovery Program. 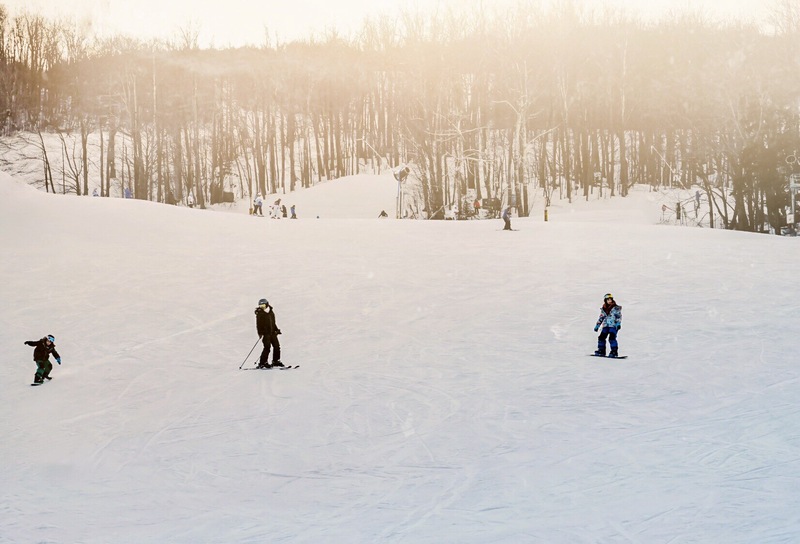 For just $139 you’ll get three days of lessons, rentals and lift tickets for seven mountains across the Northeast, including Mount Snow, Hunter Mountain, Attitash, Wildcat and more. 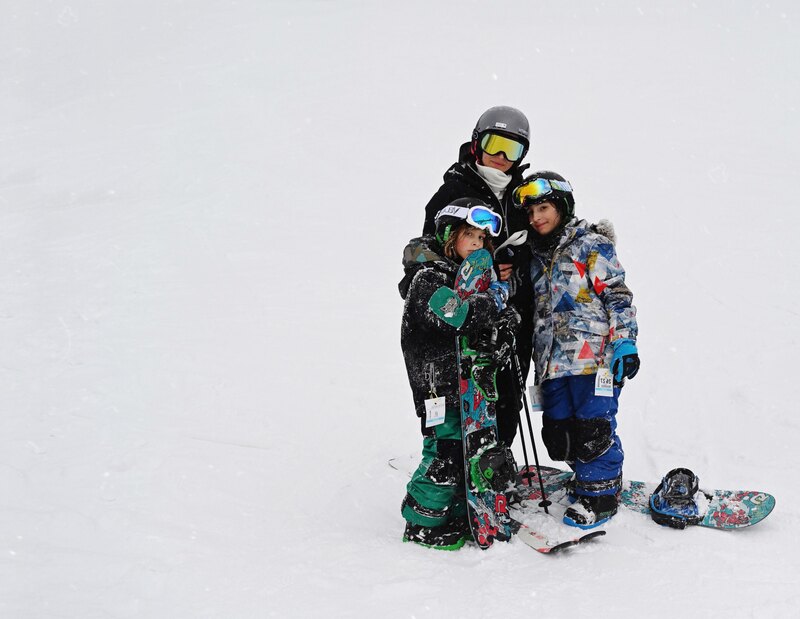 Also, check out the Momtrends Ski Guide for the full scoop on hitting the slopes with your family. Many thanks to Mount Snow for hosting us and to momtrends for media trip inclusion. Vermont looks like such a great place for a winter getaway! I really want to make my way out there one of these years… maybe Winter 2019/2020! I would love to take the family here. We live in Georgia, so there’s no snow to be found. That’s why we love ski trips so much. What an awesome vacation idea! I think our family would have a blast. Since we live in the desert, it would be a fun change of scenery too! I’ve been there before, but not for a few years. It is a super fun place to visit in the winter time. Wow, what a fun trip that was!! I would have loved to check our the slopes and maybe even tube while my kids skiied. That’s good to hear you were able to pick up on skiing after a 20 year break. I’ve been wanting to hit the slopes myself, but have been scared since it’s been about 20 years since I’ve done it as well. The resort looks like a lot of fun! Looks like you had a great time.Pictures are lovely. I really wanted to do skiing! I haven’t tried it. Vermont is one of the places in US that I need to visit soon! That looks so much fun! I am sure my family will love it here! My husband and I have been looking for a place to go skiing. This looks like a great spot! Tons of fun! I would love to try their tubing course. It looks like so much fun. I bet the girls would enjoy it as well. It looks like your family had a really great time. I think Vermont is a popular place to go skiing. Playing with snow is always fun.